In a continuing search for a viable alternative to Flash for online 3D, this week I’ve been putting ThreeJS through it’s paces. I can only hope that emerging Webassembly technology is available soon, with a decent development environment like Unity3D. Until then AS3 proves, in my opinion, to still be the best option for more complex 3D web applications, even though it means creating publishing a web (flash player), mobile and iOS versions (AIR), from identical code. 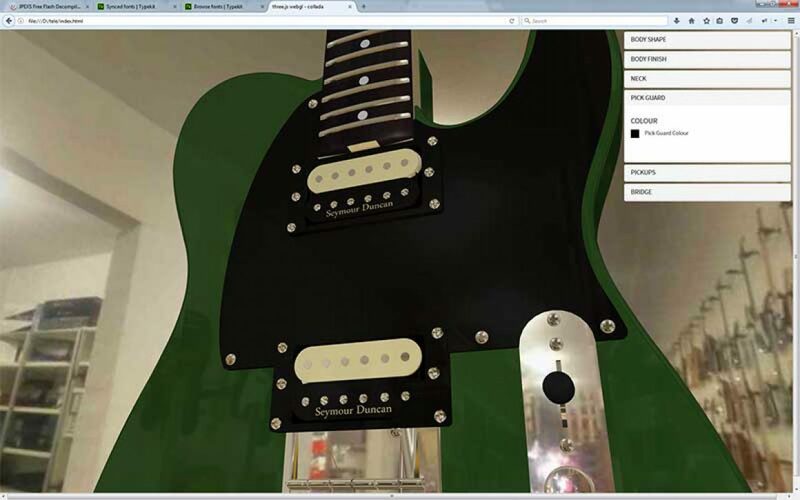 The model used is a mish mash of telecasters I found online, and it’s a little heavy weighing in at 27Mb. There is of course room for some optimization. This would be a an easy task in AS3 (Away3D), reusing geometry, decreasing model size and increasing memory efficiency. Perhaps Unity’s WebGL would also have been better, but without support for mobile, it’s no magic bullet.